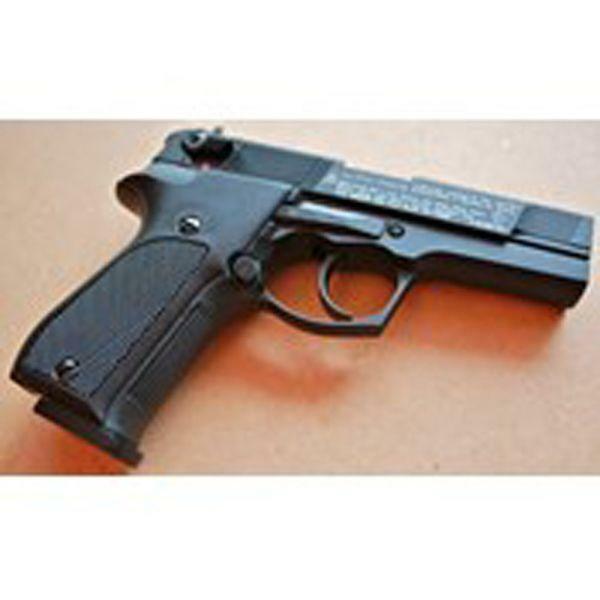 Buy Cheap Walther 2252050 CP88 CO2 Air Pistol |ReplicaAirguns.ca | New Website! 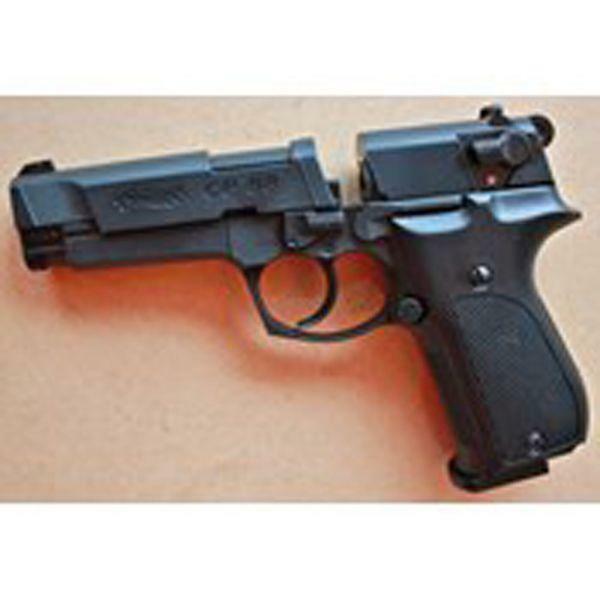 Trigger Pull: The trigger pull on the Umarex Walther CP88 is extremely nice in both single and double action mode with the single action having the lightest pull making it really easy to shoot on target with accuracy. Accuracy: I shot this air gun at a target from 20 feet away in a free standing position, and it performed very well getting about a two inch grouping close to the center of the target and staying in the two inch sweet spot even with 3 magazines or 24 rounds shot, I shot just a little bit high and to the right. The good news is the sights can be adjusted for windage if you are shooting a tad bit to the left or right. My Chrony testing with an eight shot averaged result was 360 fps using 6.9 grain RWS pellets. Build Quality: This is an almost all metal air gun with great fit and finish and a nice dense 2.25 pound weight to it. It's made in Germany, so you know it's made right? The only plastic parts to speak of are the grips which are a hard matte black plastic which matches the rest of the airgun nicely. All the mechanical parts operation are as smooth as butter. 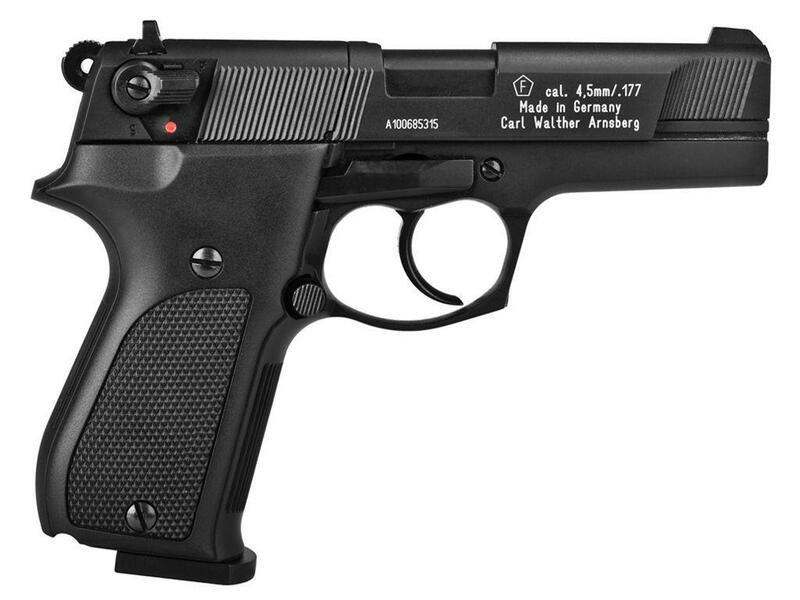 Realism: The Umarex Walther CP88 is a licensed replica of the real Walther P88 semi auto pistol. It looks very close to the real steel with the exception of the break in the slide where the rotary magazine is accessible and the extra "C" in the name. Almost all metal construction - good weight and very solid feeling gun - 2.25 pounds! 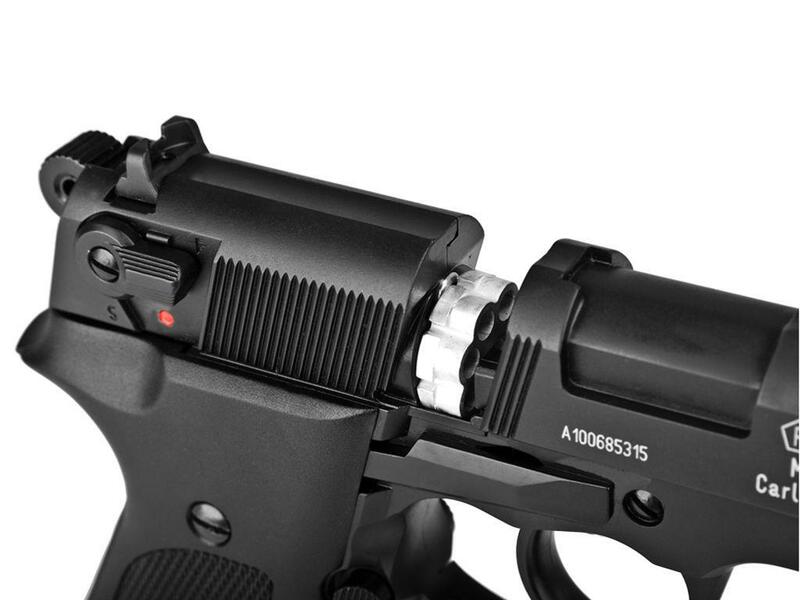 Very nice looking gun with in the Matte black - Blued finish. Double and Single Action trigger, very smooth and light. Very good accuracy, decent FPS for a pellet shooing pistol and good usage of CO2 (12 magazines). Engraving on the right side of the gun is a bit loud on the black color. Comments: I have to say I pretty much like everything about this airgun; Its size, its looks, it's German build and quality and the way it shoots. 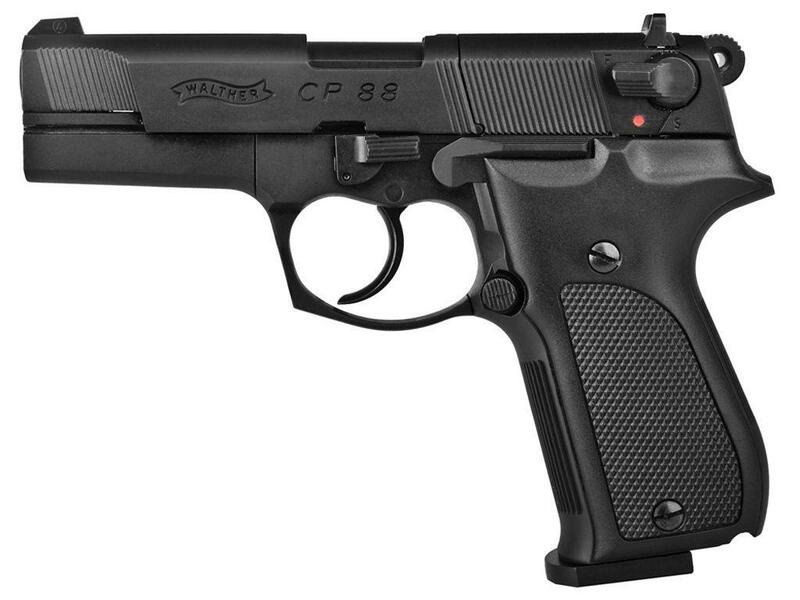 The Umarex Walther CP88 air pistol is one of those airguns I think everyone should save up for just to have the pleasure to own and shoot. It may not have blowback or a full size drop out magazine like some of the other newer styled flashier air pistols but I can tell you it is a real joy to shoot. When you hold it in your hand and point it at the target, all you can think about is how much fun you are having with this fine air gun. Just holding it in your hand; you know you got something special.Almost an exact replica of the P88 too. It's such a slick piece, nearly all metal construction and as realistic as can be.Accuracy is fantastic and has been holding up well.Comes in a nice black case with two Umarex magazines.I've had mine for over a year and there's been almost no problem. One tiny thing though.. the screw under the muzzle fell out on me one time during a session, luckily was able to find it in the grass. Good to keep an eye on that or get some thread lock on it.All in all, beautiful! 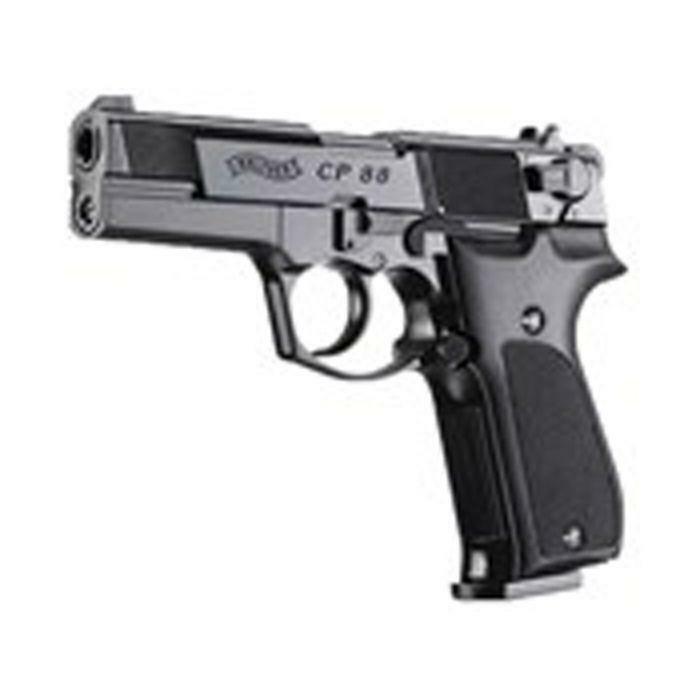 http://www.ReplicaAirguns.com - Umarex Walther CP88 CO2 Pellet Gun Review. 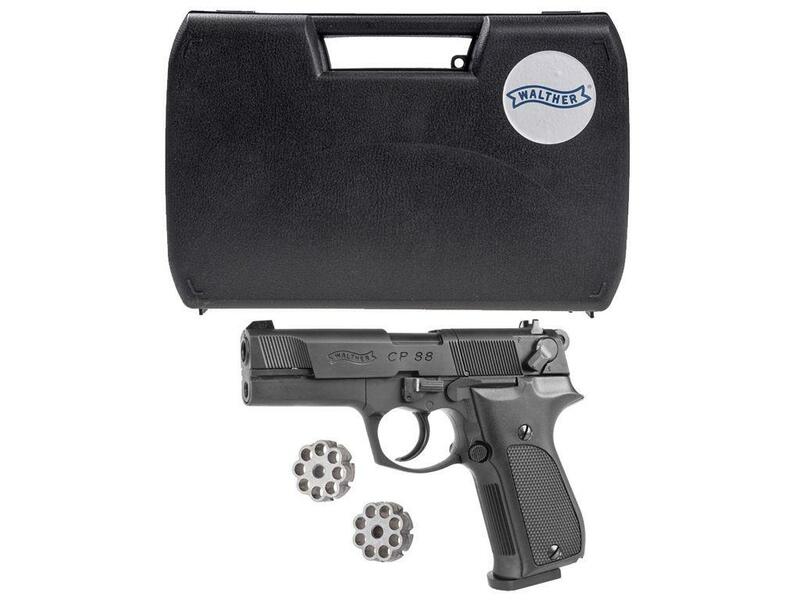 This is a table top review of the Umarex Walther CP88 CO2 .177 caliber pellet pistol in the Blued (Matte Black) finished version. I show you around the gun and walk you through its basic operation and handling. I have included some video of a target example showing you an 8 round grouping I got from 20 feet out with this fine German made air pistol. I also put the pellet shooter on the Chony Chronograph to find out its real world feet per second rating. 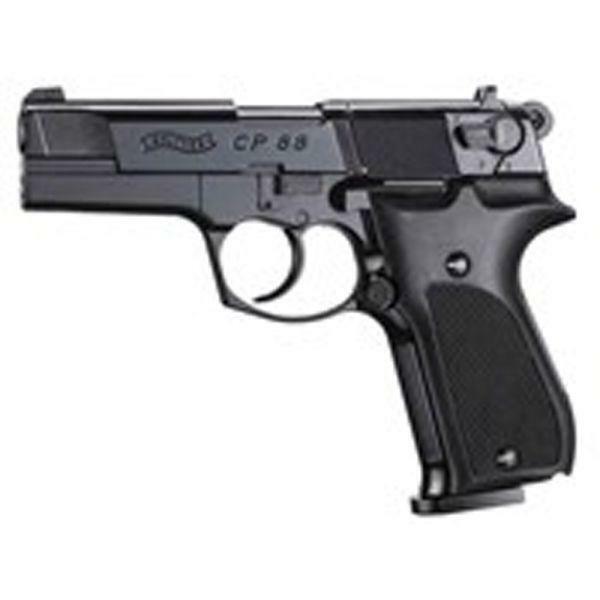 The Umarex Walther CP88 is almost all metal and very dense at 2.25 pounds. It is extremely well made. 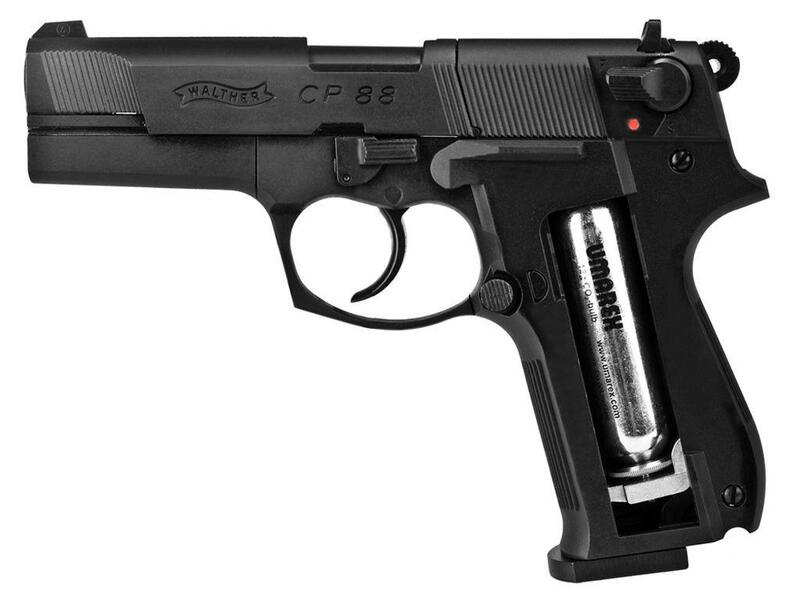 The Umarex Walther CP88 pellet air pistol is one of the higher quality airgun in my opinion. It is built to look like the real steel but it still keeps in mind that it's an airgun at heart and uses engineering that makes sense for an airgun - and so it functions extremely well.